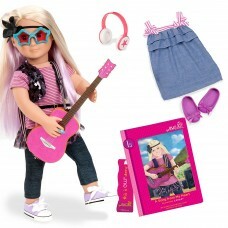 Whether it is a party or just a day at home make your doll feel like they're living the high life in.. Going my way Doll carrrier-flowers, carry your favourite doll with you wherever you go by using the ..
Rock chick Layla is ready to party in this sequinned outfit. An 18 inch poseable doll, Layla comes c..
Brown haired Parker loves to stand out from the crowd with these bright hair clips and extensions. 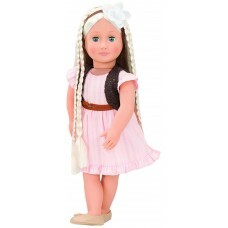 A..
White blonde Penny An 18 inch non-poseable doll with hair that grows. Penny comes with a portion of .. 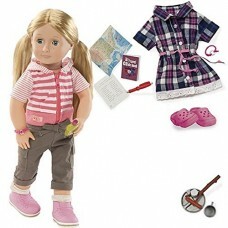 Happy Camper Shannon is ready for a day of exploring in this day time outfit. An 18 inch poseable do..
Sydney Lee will be star of the show in this ballet outfit. 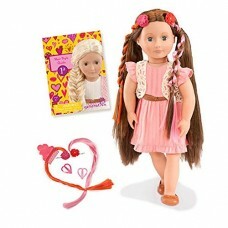 An 18 inch poseable doll, Sydney Lee come..
Phoebe wears her beautiful blonde hair in curls and plaits to match her girly outfit and matching sh..